Reducing energy consumption of a building is obviously vital to reducing CO2 emissions and winning the current war on global climate change and dirty energy. But what about all the CO2 that goes into the building? How much does it matter? “Estimating Total Energy Consumption and Emissions of China’s Commercial and Office Buildings”, a recent report by LBNL, tries to answer this question. Their findings are quite interesting. China’s buildings officially account for 19% of China’s total energy consumption but according to various Chinese academics, buildings probably account for more like 23%. This is expected to rise to 30% by 2010, broadly in line with the US. Unfortunately, the paper does not state explicitly what percentage of total CO2 emissions is accounted for by buildings, but since China’s fuel source is so predominantly coal driven, it’s probably fair to say that building energy use currently accounts for about a third of total CO2 emissions. This is significant, especially when coupled with the data from the global McKinsey Carbon Abatement Cost Curve, which calculates building efficiency to be one of the cheapest sources of carbon abatement available globally. Buildings are therefore a key leverage point for reducing carbon emissions in a cost-effective manner. The most interesting takeaway from this report is how much carbon is embodied in a building when it is built. 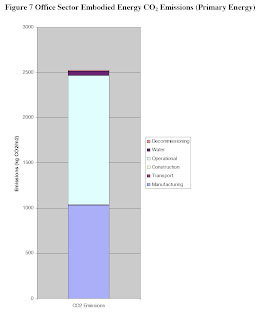 As you can see from the graph below, the building materials and construction account for approximately 40% of a Chinese commercial building’s lifetime CO2 emissions! Note that the above conclusion is based on a 30-year building lifespan. If the building were to have a longer (shorter) lifespan, the share of CO2 emissions attributed to operations would increase (decrease). The report indicated that China's embodied CO2 is pretty much in line with embodied CO2 of buildings in other countries. For reference, commercial buildings in the west typically have ~20% of their total lifetime carbon emissions embodied in construction, but this is mostly due to their higher overall energy use during their lifetimes. These statistics point to massive opportunity to reduce CO2 emissions by focusing on reducing the embodied carbon of building materials. Not only are building materials a strong carbon reduction leverage point, but the building material industry has been a laggard for some time, allowing for new, innovative companies and ideas to produce low-carbon, high-performance and cost-competitive building materials. One such company is Serious Materials. Serious is a venture backed startup firm based in Silicon Valley. Their primary product at this point is EcoRock, a low-embodied carbon drywall. Traditional drywall manufacturing processes use significant energy, but Serious Materials has developed a proprietary chemical process that allows the drywall to essentially cook itself, resulting in 80% less energy use during the manufacturing process. EcoRock is also 80-85% composed of post-industrial recycled content. The product carries only a slight premium over traditional drywalls and will be rolling out in early 2009. Serious Materials and EcoRock illustrate one example of the many possibilities for massive low-carbon innovation in the building materials industry. Mark Mitchell, VP of Business Development at Serious Materials, told me that the EcoRock innovation was easy: the drywall industry has had essentially zero innovation since it came about in the late 1890's. Serious Materials was able to leverage cutting edge materials science technology and will likely transform the industry. Another company to watch is CalStar Cement. CO2 emissions from cement production represent 5% of annual CO2 emissions globally, an absolutely astounding number. Marc Porat, CEO of CalStar, notes that since 1824, "the fundamental technology platform (calcined limestone) has not changed. Until now, that is. CalStar is developing a cement product that produces 90% less CO2 than conventional products. Imagine the CO2 abatement potential if all cement were produced using this process. Khosla-backed Calera is also said to be developing a carbon-negative cement. By the way, China produces 45-50% of the world's cement, and will watch these emerging technologies with interest. Building materials, thanks to their large contribution to carbon emissions and the historic lack of innovation in the industry, present an enormous opportunity for entrepreneurial companies to make money and reduce carbon emissions.